Services > Immigration > Applying for Residence in Macao S.A.R. Persons who intend to apply for residence in Macao as an investor, managerial personnel or specialized technical personnel may make their application in accordance with Administrative Regulation No. 3/2005 to the Trade and Investment Promotion Institute (IPIM) (Address: 1/F, World Trade Centre, 918, Avenida da Amizade, Macao; Tel: (853) 2871 2055). After the application is approved, they need to apply to the Foreigners Subdivision of the Immigration Department for "Receipt of Residence Authorization / Residence Authorization Renewal" ("Residence Receipt"), with which they can apply to the Identification Bureau for a "Macao Non-Permanent Resident Identity Card". Other persons who also intend to apply for residence in Macao may make their application in accordance with Law No. 4/2003 and Administrative Regulation No. 5/2003 to the relevant subdivision of the Immigration Department of the Public Security Police Force, depending on their status as indicated in the table below. After the application is approved, they will receive a "Residence Certificate" or a "Residence Receipt", with which they can apply to the Identification Bureau for a "Macao Non-Permanent Resident Identity Card". Applicants belonging to Category 1 will make an appointment for the application upon entry through the Border Checkpoint at the Border Gate. Applicants of the other categories may make the application by approaching the subdivision concerned and waiting for their turn, or by using our Online Appointment System. Click here for online appointment. 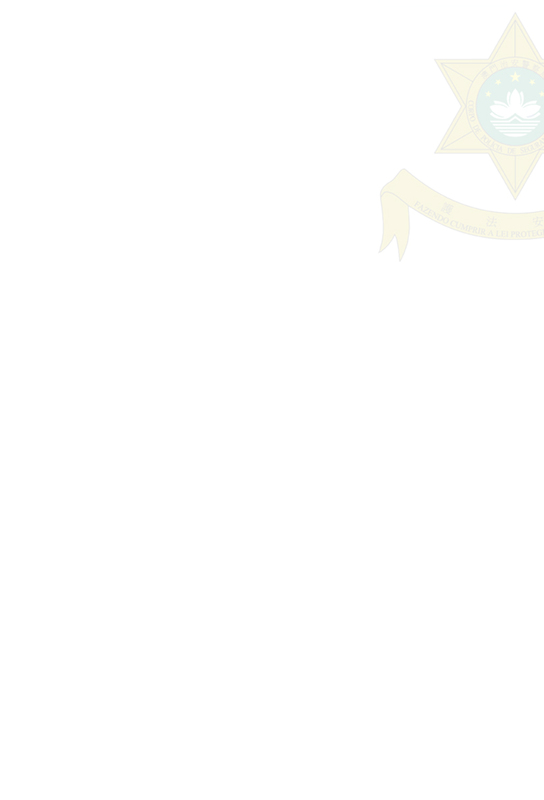 8) Other information requested by the authorities under special circumstances. Our staff will take a digital photo for the interested person at the respective subdivision. The interested person can choose to use the digital photo or his/her own recent photo (1.5-inch, full face, no-hat, white-background, coloured/black-and-white photo) on the residence document issued to him/her. This certificate is required if the interested person is 16 years old or above on the day the application is submitted. This type of applicants may apply to the Identification Bureau for the certificate by presenting the "notification" granted upon entry or the receipt of the application for "Residence Authorization", together with the "P.R.C. Permit for Travelling to Hong Kong and Macao". To facilitate the application procedure, the applicants can first apply to the Identification Bureau and authorize the Bureau to send the certificate directly to the Immigration Department. Then they may apply to the Residents Subdivision for "Resident Authorization". 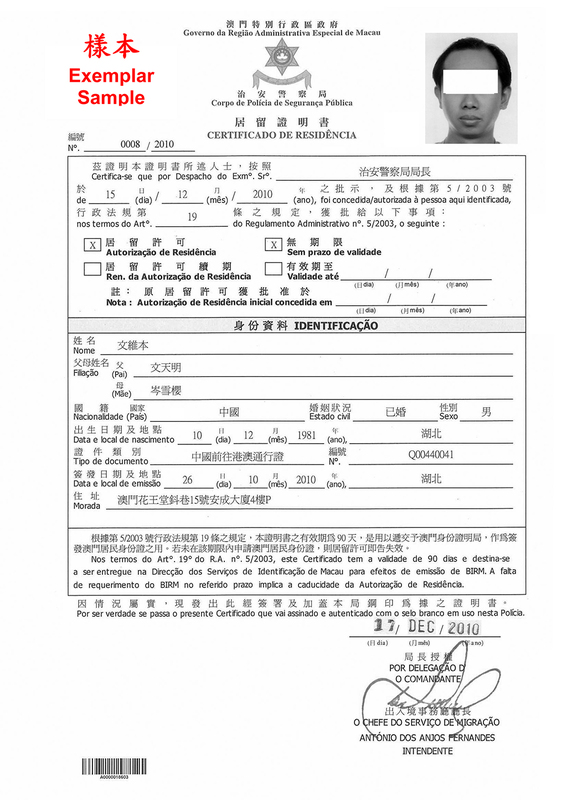 Applicants who have been verified by the Identification Bureau and are preliminarily eligible to be a permanent resident in Macao (with an "R" symbol indicated below the photo on their "P.R.C. Permit for Travelling to Hong Kong and Macao") are exempted from submitting documents 3) to 6). If the personal information declared before is different from that of the current application, the interested person should submit a Notarial Birth Certificate and/or a Notarial Marriage Certificate or other certificates accordingly for verification. Document indicating the interested person's residential address in Macao (e.g. : copy of water bill, electricity bill, phone bill, etc. of the last 3 months). 2. Proof of the minor child studying in Macao (if any). Parent(s)' written statement of the status of the family member(s) (e.g. number of children, age, type of document in possession of, country of domicile, marital status, whether they are Macao residents or not, etc.). 4. Document stated in D.3. Certificate of the interested person's academic background or professional skill. Proof of previous employment, education or living in Macao. After receiving the residence application of the persons listed in Points A, B and C, the authorities will issue an "application acceptance receipt", which includes the necessary documents that have not yet been submitted. The interested person (or the legal representative) should submit them within 180 days from the date the receipt is issued (or the date he/she is notified to supplement other documents). Otherwise, the authorities may announce the extinguishment of the application according to Article 103 of the Code of Administrative Procedure. Submit the "Non-resident Worker's Identification Card" (or the former "Non-resident Worker's Permit", also known as blue card) (if any) for cancellation. For approved application, the interested person (or the legal representative) will be issued a "Residence Certificate" after he/she pays the fee (Chinese nationals are exempted) within the period specified on the notification letter. For disapproved application, the interested person will receive a written notice of the content of the written instructions and the means to appeal. While waiting for the result of the residence application, persons of Portuguese nationality and minor children who are born outside the Macao S.A.R. and whose parents are Macao permanent residents / "P.R.C. Permit for Travelling to Hong Kong and Macao" holders granted residence in Macao can apply to the Residents Subdivision for single or multiple extension of Authorization to Stay (by using an application form for extension of "Authorization to Stay", for detail, please see "Special Authorization to Stay" for Applicants of Residence Authorization) on the day they submit the residence application or on a later day by presenting the Application Acceptance Receipt. When receiving the residence application of the applicants in Point B (minor children who are born outside the Macao S.A.R. and whose parents are Macao permanent residents / "P.R.C. Permit for Travelling to Hong Kong and Macao" holders granted residence in Macao) and Point C (persons of Portuguese nationality), the Immigration Department can deny part of or the whole application accordingly if the applicant's passport / travel document and return / re-entry permit is expiring in less than 30 days. Copy of water bill, electricity bill, phone bill, etc. of the last 3 months of the latest address (if the interested person has changed address). Other information should be submitted upon request by the authorities under special circumstances. According to Term 2, Article 22 of Administrative Regulation No. 5/2003, renewal of the Residence Authorization depends on whether the application meets the prerequisites and requisites stipulated in Law No. 4/2003 and the above Administrative Regulation, especially whether the applicant (or the applicant and his/her reuniting kindred, or the applicant and the family members involved in the application and the reuniting kindred) habitually resides in Macao. In other words, they should make Macao a centre of living and reside in Macao for not less than 183 days per year starting from the effective date of the Residence Authorization. In addition, whenever they leave Macao, they should not be away for more than half a year. Otherwise, the applicant's (and the family members involved) application for renewal of Residence Authorization may not be approved. Persons who have their final application for renewal of Residence Authorization approved should pay attention to the conditions causing the invalidation of the Residence Authorization specified in Article 24 of the above Administrative Regulation, e.g. not habitually residing in Macao and not meeting the prerequisite for the Residence Authorization. These persons (or their reuniting kindred) should continue to comply with the above stipulation of staying in Macao even during the 5th to 7th years of residence in Macao. Otherwise, their Residence Authorization may be invalidated. After receiving the application, the authorities will issue an "application acceptance receipt", which includes the necessary documents that have not yet been submitted. The interested person (or the legal representative) should submit them within 180 days from the date the receipt is issued (or the date he/she is notified to supplement other documents). Otherwise, the authorities may announce the extinguishment of the application according to Article 103 of the Code of Administrative Procedure. The parent or guardian representing the minor child in the application should present his/her valid identification document and proof of their relationship; other legal representative should present a certified letter of authorization and his/her valid identification document. For approved application, the interested person (or the legal representative) will be issued a "Residence Certificate" after he/she pays the stamp duty of MOP100 within the specified period. For disapproved application, the interested person will receive a written notice of the content of the written instructions and the ways to appeal. 3) Processing time: around 10 working days. After receiving the residence application, the authorities will issue an "application acceptance receipt", which includes the necessary documents that have not yet been submitted. The interested person (or the legal representative) should submit them within 180 days from the date the receipt is issued (or the date he/she is notified to supplement other documents). Otherwise, the authorities may announce the extinguishment of the application according to Article 103 of the Code of Administrative Procedure. If the interested person is not able to collect the "Residence Receipt" (because he/she has to be fingerprinted on the Receipt) within 180 days after the appointed date or within the period specified in the notification letter (around 180 days from the date of issue of the letter), it may result in the extinguishment of the application and invalidation of the Residence Authorization. To prevent the above invalidation from happening, the interested person may request the legal representative to pay the fee at the Foreigners Subdivision within the specified period first and then he/she comes in person to collect the "Residence Receipt" later. For disapproved application, the interested person will receive a written notice of the content of the written instructions and the means to appeal. While waiting for the result of the residence application, the interested person can apply to the Foreigners Subdivision for single or multiple extension of Authorization to Stay (by using an application form for extension of "Authorization to Stay", for detail, please see "Special Authorization to Stay" for Applicants of Residence Authorization) by presenting the Application Acceptance Receipt. Buyers and promissory buyers of an immovable of the Macao SAR. The promissory buyers should provide proof of having fulfilled the contract within 180 days from the payment deadline of the respective fee. For approved application, the interested person should come to pay the fee (Chinese: MOP100, Others: MOP200) and collect the "Residence Receipt" within the specified period. For disapproved application, the interested person will receive a written notice of the content of the written instructions and the ways to appeal. 2) Processing time: around 18 working days. No guarantee of return to the place of origin, reason to suspect the authenticity of the travel document, insufficient financial resources to sustain oneself for the intended period of stay, lack of return ticket to the place of origin. F. Humanitarian reasons, particularly lack of survival conditions or family assistance in another country or region. Habitual residence of the interested person in the Macao SAR is a condition for maintaining the Residence Authorization. B. A guarantor or bank guarantee. Payment of the fee specified in Paragraph A above (i.e. MOP20,000) is a condition for the Residence Authorization to come into effect. Chinese citizens residing in Mainland China can be granted Residence Authorization in the Macao SAR only if they possess the document issued by the competent authorities in China for this purpose. The Chief Executive can, for humanitarian reasons or under exceptional circumstances where reasonable justifications are given, grant Residence Authorization by waiving the requisites and conditions stipulated in this law and the procedures specified in the complementary regulation. After the above exemption is granted, persons other than those specified in the relevant written instructions cannot request the same exemption on the basis of being in the same situation or having more reasonable justifications. Residence Authorization Renewal depends on whether the presuppositions and requisites stipulated in the principle law (Law No. 4/2003) and the administrative regulation (Administrative Regulation No. 5/2003) are met. The declaration listed in Table 1 serving as proof of (maintaining) marriage or de facto marital relation should contain the declarant's signature which is to be certified by the competent authorities of Macao or another country/region. Otherwise, the interested person, his/her spouse (or partner of marriage de facto) and the two witnesses are required to come in person, sign the declaration in the presence of the staff accepting the application and present the original of their identification document for verification. (2) The service unit will provide the template of the declaration listed in Table 1. The service unit will only collect the copies of the above documents, but the originals have to be exhibited for authentication. The document is issued by a country which has certification-free agreement with Macao (e.g. according to the legal and judicial assistance agreement with Portugal and East Timor, documents and translations issued or certified by the court or competent authorities of these two countries require no certification as long as they are affixed with an official stamp.). The Philippine consulate in Macao or the Chinese Embassy in the Philippines certifies the authenticity and legality of the signature of the above Philippine official. Unless the minor is represented by the parent, the representative should submit: a. a certified letter of authorization; b. a copy of his/her valid identification document. 2 copies of the "Declaration" issued by IPIM (certifying that the application for Residence Authorization is under examination). All 10 fingers of the interested person have to be fingerprinted (applicable to applicants who come in person and applicants under 5 years old are exempted). Applicants who meet the requirements will be granted a maximum of 9 months of "Special Authorization to Stay". Documents (1), a copy of document (3) specified in Point 1) and a copy of the "declaration" issued by IPIM are required if the "Special Authorization to Stay" has to be extended. Generally, the application for extension will be processed according to the "Quality Criterion". Application form of change of personal information or notification of change of address, together with supporting documents such as birth certificate, certificate of marital status or document indicating the residential address, if there is any change in the personal information or address of the interested person. 2) Persons who have never applied for "Special Authorization to Stay"
After confirmation of receipt of the residence approval letter from IPIM to the Public Security Police Force and the accuracy of the necessary documents and information, the authorities will prepare the "Residence Receipt". The interested person is required to collect the Receipt in person (because he/she has to be fingerprinted on the Receipt). If any error is found in the information during investigation, the authorities will notify the interested person to supplement relevant supporting documents (e.g. birth certificate, marriage certificate, divorce certificate or death certificate of spouse). Therefore, the "Residence Receipt" can only be issued after all necessary documents are submitted and all irregularities are fixed. Application form of change of personal information or notification of change of address, together with copies of supporting documents such as birth certificate, certificate of marital status or document indicating the residential address, if there is any change in the personal information or address of the interested person. F. Expiry of Residence Authorization stated in the "Residence Receipt"
Applicants may make the application by approaching the subdivision concerned and waiting for their turn, or by using our Online Appointment System. Click here for online appointment. 1. Expiry of "Residence Certificate"
"Residence Certificate" is valid for 90 days from the date of issue. Within this period, the applicant can apply to the Identification Bureau for a "Macao Non-Permanent Resident Identity Card" (persons who have been verified preliminarily by the Bureau to be eligible to be a permanent resident in Macao, i.e. persons whose "P.R.C. Permit for Travelling to Hong Kong and Macao" bears an "R" symbol, may apply to the Bureau for a "Macao Permanent Resident Identity Card"). If no application is made within this period, the "Residence Authorization" will be invalid. Applicants have to apply to the Residents Subdivision for "Residence Authorization" again. 2. Expiry of Residence Authorization stated in the "Residence Certificate"
Only persons of Portuguese nationality are required to apply for Residence Authorization renewal at the Immigration Department. 3. Application for "Macao Permanent Resident Identity Card"
After collecting a "Macao Non-Permanent Resident Identity Card" from the Identification Bureau, persons listed in Point 1 (not including those who have been verified preliminarily by the Identification Bureau to be eligible to be a permanent resident in Macao, i.e. persons whose "P.R.C. Permit for Travelling to Hong Kong and Macao" bears an "R" symbol) and Point 2 of the above table do not have to apply to the Immigration Department for Residence Authorization renewal. They can apply to the Identification Bureau for a "Macao Permanent Resident Identity Card" after residing in Macao consecutively for 7 years from the date of approval of the Residence Authorization application. 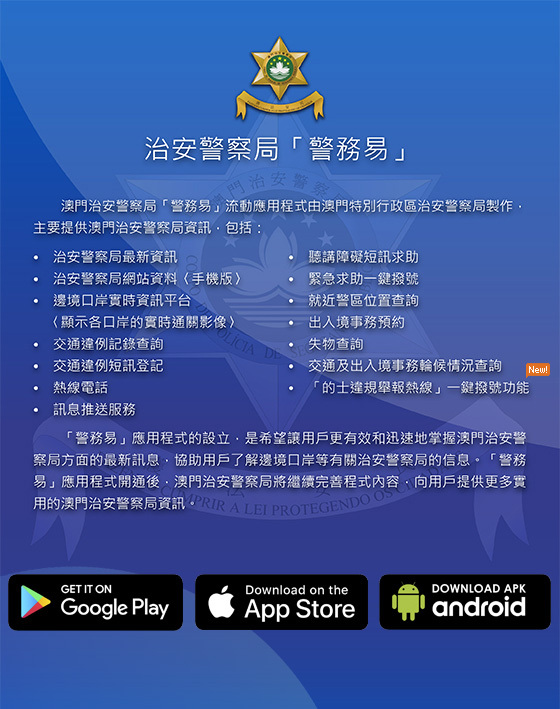 If the persons listed in Point 1 have been verified preliminarily by the Identification Bureau to be eligible to be a permanent resident in Macao, they do not have to apply to the Immigration Department for Residence Authorization renewal. 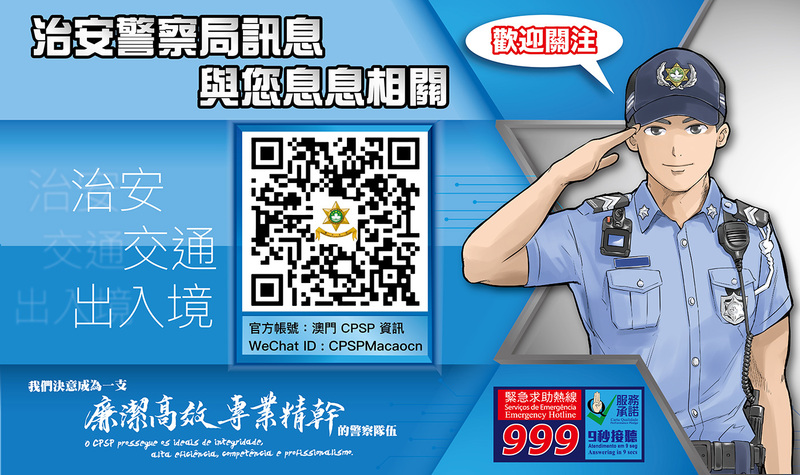 They can apply directly to the Identification Bureau for a "Macao Permanent Resident Identity Card" by presenting the "Residence Certificate" issued to them upon approval of their Residence Authorization application. Persons of Portuguese nationality are required to apply to the Immigration Department for Residence Authorization renewal. They also need to apply to the Identification Bureau for a new "Macao Non-Permanent Resident Identity Card" by presenting the "Residence Certificate" issued to them upon each approval of renewal application. They can apply to the Bureau for a "Macao Permanent Resident Identity Card" after they are granted residence in Macao for 7 consecutive years. Recidivism means the same offence is repeated within 1 year from the date of last offence. 2. Expiry of "Residence Receipt"
"Residence Receipt" is valid for 60 days from the date of issue. Within this period, the applicant can apply to the Identification Bureau for a "Macao Non-Permanent Resident Identity Card". If no application is made within this period, the "Residence Receipt" will be invalid. According to Item 3, Term 1, Article 31 of Administrative Regulation No. 5/2003, the fee for the reissue of a "Residence Receipt" at the Immigration Department is MOP200. However, if the "Residence Receipt" is lost, damaged, stolen or expires and reasonable justification is given, the fee will be MOP50. 2) Expiry of Residence Authorization stated in the "Residence Receipt"
Upon approval of the residence application, the interested person will be granted Residence Authorization which expires in 1 year in principle from the effective date. He/she has to apply to the Foreigners Subdivision of the Immigration Department for renewal within 30 days before its expiry date. Each renewed Residence Authorization expires in 2 years. The interested person has to apply to the Immigration Department for Residence Authorization renewal and apply to the Identification Bureau for a new "Macao Non-Permanent Resident Identity Card" by presenting the "Residence Receipt" issued to him/her upon approval of the renewal application. He/she can apply to the Bureau for a "Macao Permanent Resident Identity Card" after he/she is granted residence in Macao for 7 consecutive years.